ATM manufactures Endlaunch type Waveguide to Coax Adapters covering a full frequency range for Rectangular Waveguides, with multiple flange and Coaxial connector configurations available. These short length Waveguide To Coax Adapters are perfect for use in applications where space is limited. We also offer a complete line of standard size Endlaunch Waveguide to Coaxial Adapters and Right Angle Waveguide To Coaxial Adapters for microwave systems where space is not restricted. For more information please call us to discuss your Waveguide to Coaxial Adapter requirements with one of our design engineers. ** Outline drawings are of listed model numbers. 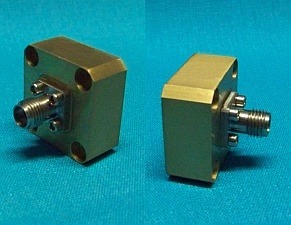 Any other flange type may affect the size of the component. Contact factory for optional flanges and dimensions.